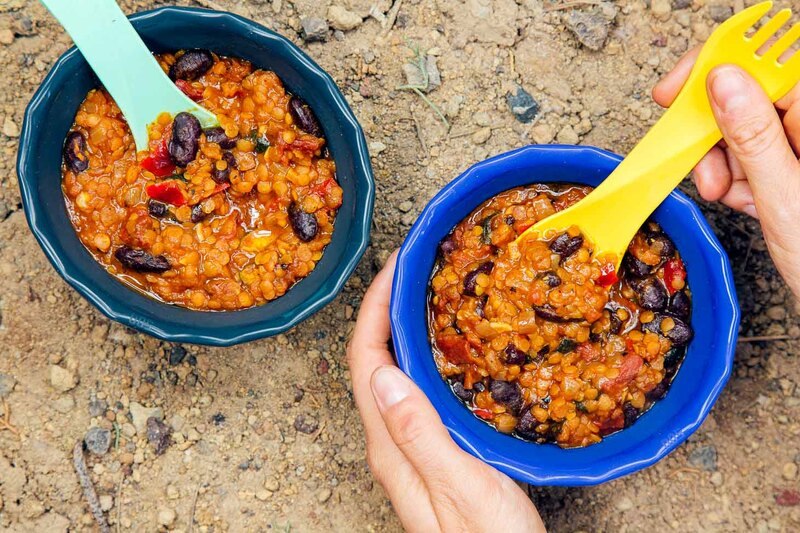 This warm and hearty vegan backpacking meal is loaded with plant-based protein to keep your muscles fueled on the trail. Cheap to make, quick to cook, and guaranteed to fill you up! We like incorporating a few vegetarian options in our backpacking meal plans. They’re relatively inexpensive to prepare and tend to be less susceptible to spoiling while hiking. The only problem is they can be light on protein. That’s not such a big deal for quick overnight trips, but on longer multi-day hikes, getting enough protein can be critical – especially if we are really working our muscles. But if we wanted to bump up the protein, then we would have to get creative. A lot of vegan and vegetarian hikers use protein bars to supplement their trail diet. While this approach definitely works, we find ourselves suffering from protein bar fatigue mid-way through Day Two. So the idea of having another protein bar for dinner just doesn’t sound appetizer to us. What we’re looking for is a meal, a vegan meal, a vegan meal with a LOT of protein. And that’s where this Red Lentil Chili comes in! Using a combination of red lentils and kidney beans, this vegan chili is filled with over 20 grams of protein per serving. (Twice what you’ll find in most protein bar!) Red lentils are a great source of plant protein but can take a long time to cook (around 25 minutes) Not very practical on a tiny backpacking stove with limited fuel. So we opted instead to cook everything at home and then dehydrate it. Then on the trail, all we need to do is add water and boil for 10 minutes. Now when it comes to chili, everyone has their own preference. Some like it hot, some like it mild, and some like no spice at all. And that’s another reason why this particular recipe is so great. By making this recipe at home and then dehydrating it, you’re able to test the final product before fully committing to it. Because the last thing anyone wants when backpacking is to discover the bowl of chili you packed for your dinner is too spicy to eat! 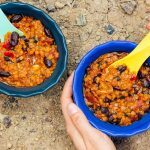 So if you’re a vegetarian or vegan backpacker searching for a way to keep your muscles fueled over the course of a long hike, break out the dehydrator and give this Red Lentil Chili a try. 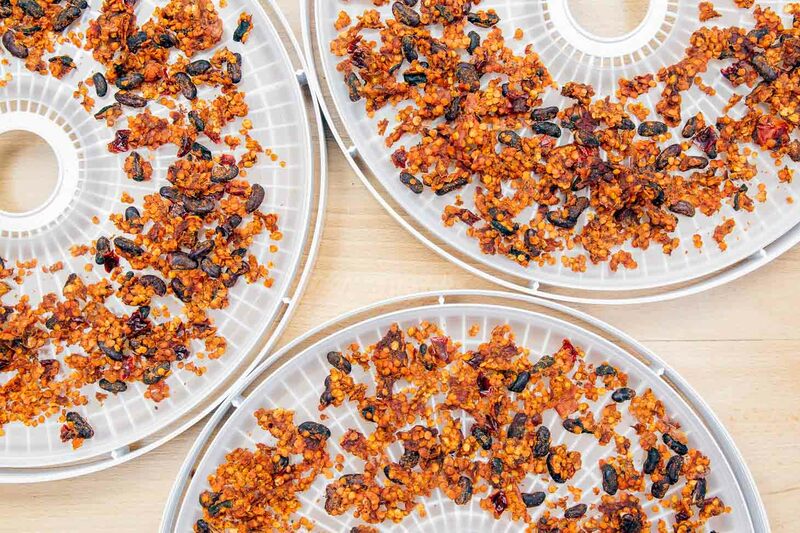 From making jerky and fruit leathers to drying fresh fruits and vegetables for longer term storage, or even creating dehydrated just-add-boiling-water for backpacking trips or emergencies, there are dozens of ways to use a dehydrator. Heat the oil in a large pot or Dutch oven over medium heat. Once the oil is hot, add the onions, peppers, and salt and saute until beginning to soften. Add zucchini and cook until vegetables are soft and beginning to turn golden in spots. Add garlic, cumin, and chili powder and saute until fragrant (about 30 seconds). Add the tomatoes, beans, tomato paste, and 2 cups broth, stir to combine. Bring to a simmer, then add the lentils. Simmer for 20 minutes, stirring occasionally, until the lentils are tender, adding more water if needed. Stir in sugar and adjust seasoning to taste. Remove from heat. To dehydrate, spread the chili onto dehydrator trays lined with solid fruit leather sheets, ensuring the chili is in a thin, even layer. Dehydrate at 135F for 8-12 hours, until the chili is dry and crumbly. Package in sealable bags and store in a cool, dark place or your freezer for longer storage.Pack the dehydrated chili and a small bottle of olive oil (3-4 tablespoons total) in your bear barrel. 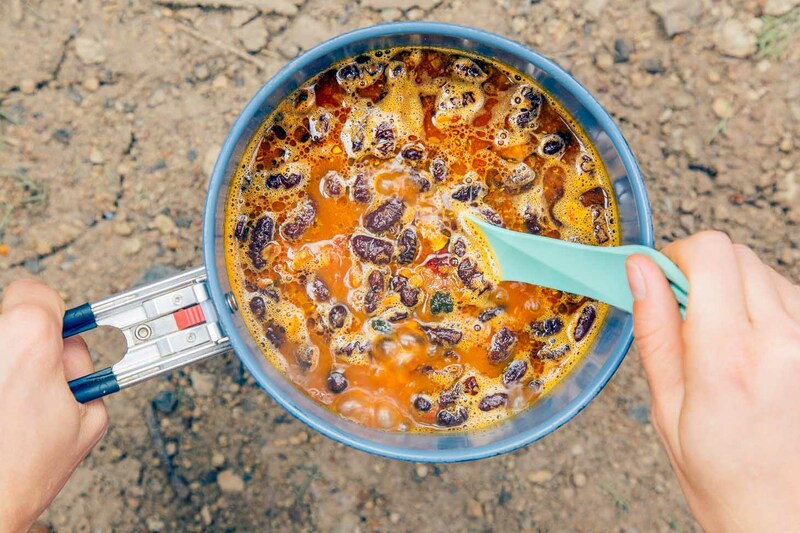 To prepare in camp: At mealtime place the chili, ~1 cup water per serving (enough to mostly cover the chili), and 1 tablespoon oil per serving in a cookpot. Bring to a boil, then reduce to a simmer and cook for about 10 minutes, stirring frequently, until the beans and lentils and tender. Tip: If you have time, you can let the chili soak for a bit before bringing it to a boil, which will reduce the simmer time, therefore reducing fuel consumption. Think ill be trying this recipe soon. Thanks for the recipe!